Wooden Warrior, Quassy Amusement Park (Middlebury, CT) Super fun junior wooden coaster constructed by Gravity Group. Quassy's a really small park, but this is a gem of an attraction and a suitable replacement for the old Herschell Monster Mouse (last of its kind) that ran at the park for 50ish years. Super Flight, Rye Playland (Rye, New York) I love Rye, but decisions like buying this ride are why its been a challenge for the County that owns it to justify operating the place against the wishes of its rich, white NIMBY residents. 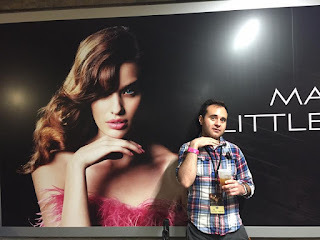 Yeah, I said it. It's true too: a bunch of rich white people are mad because Rye Playland is a park available and cheap enough to be entertainment for Hispanics and African Americans and thus lowers the real estate value. Greenwich, CT had to fix the beaches there by charging people something like $200 to park. I hear rich folks are fleeing CT, and long term it'll be OK if they stop being a bedroom community state. Oh, the ride? The ride is bad. Zamperla Volares are small footprint flying coasters (meaning you are in a lay-down position), and they're all horrible rides where you feel like you're being shaken in a cage. This is no different. Never had a line when other attractions had 90 minute waits. 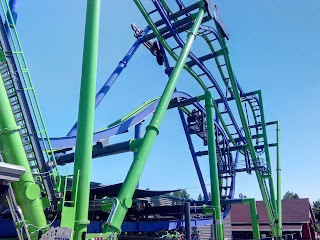 The Joker, Six Flags New England (Agawam, MA) We were seeing family in the area and all of them were like "So you guys excited about riding the Joker coaster?" And I suppose maybe kinda sorta? This is like the Intamin Zacspin coasters, which is to say that naturally it is much better mechanically and operationally than the Intamin Zacspin coasters and thus is getting bought and replicated at an exponentially higher level than those. The cars flip and it feels like a flat ride more than a coaster; I don't hate it, but I also feel no great excitement to ride it. Lucky for us, it rained a lot and was really quiet. I loved the Riverside Cyclone. Seriously. I was scared as hell of it when I first got into coasters because it had a ferocious reputation, and it wasn't until about 1999 that I really got into riding it. It had nasty Morgan trains at the time that in many ways amplified the forces it put on riders and dear lawd; there were forces. There's stories about Bill Cobb making this ride extra extreme because he had heart pains. 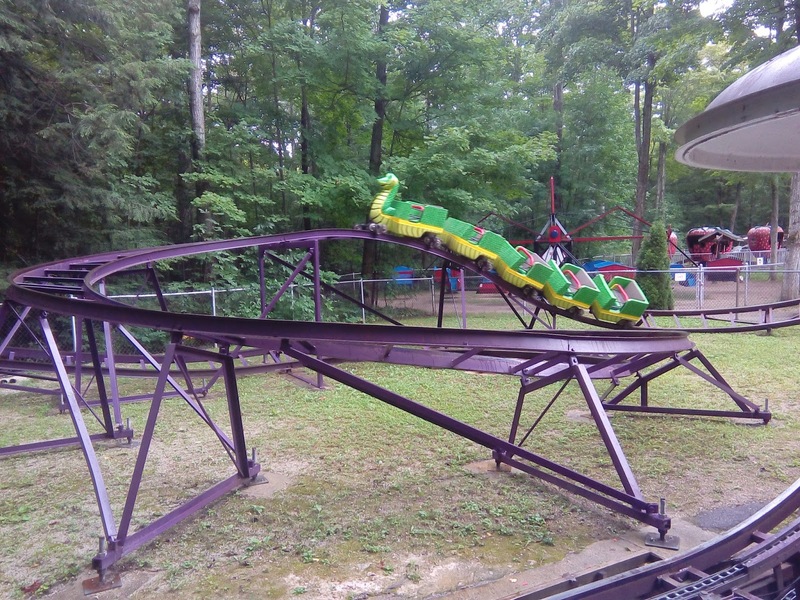 In 2000, PTC trains came on board and while they were initially the improvement everyone always wanted, they were so heavy that they tore the ride to bits. The first drop was neutered in 2001 and the ride was never the same. That it had hung on that long was largely a testament to Riverside Park's clientele pre-Six Flagsization; a huge draw was the 1/4 mile short track that ran where Superman: Ride of Steel is today and that brought some hardy people ready for fist fights, beer, and rides that could kick their asses. It got the Rocky Mountain treatment, and while I'm sad the Cyclone is officially dead, the ride it was replaced with is awesome. Really awesome. And it'll be awesome for generations to come. There's crazy inversions, awesome airtime, laterals, you name it, it has it. It peters out ever so slightly at the end unlike the old Cyclone with its wild oscillating airtime hill finish, but that's minor in the grand scheme of things. I'll miss the original, but I look forward to riding the new one again (and again). Spinning Out, Beech Bend Park (Bowling Green, KY) My first SBF Kidding Spinning Coaster! Okay, that wasn't worth an exclamation mark. These are popping up like crazy, and they spin, which makes them slightly less horrible to ride than standard unspinning kiddie coasters. Tibidabo is an incredible park in concept, but sadly it was lacking...something. It has a weird suspended monorail/dark ride hybrid, and a couple of classic rides that you literally cannot find anywhere else on earth (one of which, Avio, was down on our visit) in one of the more striking scenes of any park; atop a mountain overlooking Barcelona and the Mediterranean. It has a funky Automata museum with very early animatronic figures, a haunted walk through, a huge church overlooking it, it's really crazy, right? And I like crazy. I really do. But....yeah, something's missing. Maybe another dark ride, or a thrilling flat ride, or a better way to get up the mountain than a hyper expensive trolley or sluggish and well tagged funicular. I don't know. Muntanya Russa is a thoroughly passable Vekoma coaster that's actually got very strong g-forces in its helices and turns, but no airtime really to speak of and just...I wish this was a more interesting coaster, folks. Stampida, PortAventura (Salou, Spain) I'll level with you: I like wooden coasters. Like more than anything else in amusements or themed entertainment. I love dark rides. Odds are that I went on more dark rides than you this year, and if not, then we have mutual friends and you count coasters too. I love big spectacular Euro flats. Can talk about them for days. I love steel coasters. I mean I've been on like 700 of them now, I think that's strong evidence. But wood coasters? Wood coasters are everything. Nothing drives me harder to go somewhere than them. Stampida is two wood coasters that race and duel with unique rolling stock at a big theme park designed by Busch and operated for awhile by Universal. It's been on my bucket list for an eternity. So is it good? Well, it isn't that bad. The trains aren't the best in the world or anything, and they barely raced it when I was there, but it ate through lines in short order and when it does race, its fun to see the trains interact. It could have been more, but it was perfectly fine. Tomahawk, PortAventura (Salou, Spain) Speaking of wood coasters, a junior woodie that entertwines itself with Stampida! It's fine. Diablo, PortAventura (Salou, Spain) It's a big mine train coaster, and it eats people, but it doesn't do anything particularly special and everything you see is totally static. I'd heard for years now that Dragon Khan, the first 8 inversion coaster ever built, was rough as hell. Sure enough, no one was lying. That's too bad. Possibly the worst B&M I've ever gone on that isn't a stand up. Also, if anyone tells you it is Kumba with an extra inversion, they are lying and never listen to them again. Shambhala, PortAventura (Salou, Spain) B&M hyper coaster with a lame ending and a really cool looking helix/turnaround. I liked it fine: best coaster in the park. Oddly, we didn't choose to re-ride this one because the wait was always ridiculously long and Spanish crowds are rowdy. More on that in a moment. Tami Tami, PortAventura (Salou, Spain) Vekoma Roller Skater not unlike the ones Disney and Universal built as their junior rides, except it went from Polynesian themed to Sesame Street. 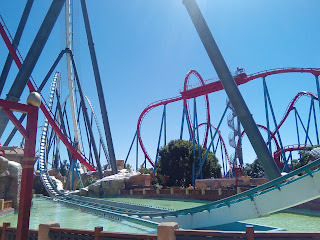 Furius Baco, PortAventura (Salou, Spain) So this was the big coaster we rode twice and boy is the internet divided on it. The majority will say that it is complete trash; you can't select a seat, which is a big problem since apparently only the front middle seats won't kill you. But if you get one of those seats, it is suggested to be next level stuff. I did not get that seat because I gave it to my wife. My other ride was in the back, also not in a middle seat, subjecting me to all the vibrations. First off: The people that are in love with this thing are hilarious. It's basically a really high speed set of turns and then a zero g-roll taken at less speed because it bleeds so much off from air resistance. You literally need to have pulled a paycheck from Intamin to claim that this is that kind of ride, and some people who are huge fans have, so I guess I can understand that. The haters too are wrong: I mean, OK, it vibrates a bit and shakes some. I can't say it doesn't. But it isn't like it bashes you everywhere upside the head or does anything that uncomfortable. Furius Baco is more like riding a wood coaster that could use some work but still performs well enough to re-ride. You can see the flaws but they don't totally undermine the attraction, which has a really interesting theme (monkeys, wine, robots; no lie) and a set of high speed turns that are at least taken in a trough to look more exciting. Top Thrill Dragster/Kingda Ka's European bretheren. The hydraulic launch is replaced with linear induction, because magnets are probably more reliable though don't get the ride going quite as fast. There's also no spiral drop down like with the 400 footers in the US, which is in Red Force's favor. And there's a little airtime bump just before the brakes. And lapbars only, which is good. I like Dragster slightly more because of the better acceleration and sense of speed because of the train's minimalism, but I'm very much splitting hairs. Russian made shuttle loop that's like nothing you've ever seen. The reverse spike is tilted at something like 140 degrees, so in spite of being a shuttle ride that goes through the full layout forwards and backwards, it has an odd number of inversions. Is it good? I liked it. My wife liked it. It doesn't really hurt or vibrate that bad. It is very weird being held nearly upside down on the lift and then actually being upside down when you reach the end. Drachenjagd, Legoland Deutschland (Günzburg, Bavaria, Germany) I like going to the Legoland parks plenty, but the truth it that what's at the German park is more or less the most generic versions of their coasters. If you go to Legoland California, you can basically ride these three coasters there; same layouts, different themes for the most kiddie of the rides, but it's just aesthetics, nothing structurally important. Rasender Tausendfüßler, Tripsdrill (Günzburg, Bavaria, Germany) This was adorable. It had antenna that were all wobbly and stuff. If you're gonna build a simply family coaster, these are comparatively cheap, reliable, and decently high capacity. Oh my god, so gnarly. I spoke very highly of Tripsdrill when I did our podcast on the park back this summer, and for good reason. It's a unique and truly outstanding theme park with really creative stuff everywhere. Karacho being the creation of a mad inventor comes across the language barrier in spades. The layout for the ride features a surprise in the dark zero g-roll before ever hitting the first launch. There's airtime, good positive G-forces, wacky twisted track, it's so good. So good! Mammut, Tripsdrill (Cleebronn, Baden Wuerttemberg, Germany) The darkest secret in coasterdom is that the company that built all the really great 2000s wood coasters for Intamin apparently seems to have cut bait with Intamin and went to work with Gerstlauer in for this, the last ride they ever produced. It's themed to big trees, and there's an elaborate show lift hill and then pretty much no action on the ride itself. Really a let down. G'sengte Sau, Tripsdrill (Cleebronn, Baden Wuerttemberg, Germany) It's themed to a sleigh ride and takes place around the castle where the log flume that's themed to a fountain of youth and has bathtub cars is. Also it is really, really good. As far as "family" coasters go, this is a totally suitable ride for a kid of 5-6, but it actually has stuff going on for it. It leaps the hedges! Oh, and there's airime and super sweet turns. Why does Tripsdrill have to be so far away? : So this ride has a 200lb weight limit or so, and I probably exceed that. I figure, hey, if I had a kid with me, they would be in car too, and if I was 190, they'd be like 40-50, and we'd be bigger than I am, so what's the big deal? This is a kiddie coaster built by the Allan Herschell Company, which basically ceased to exist in the 1970s, OK? It isn't new. It feels like a ride that was probably build somewhere in the 1960s and could fall apart under me. I mean, really, that could happen. The metal isn't that thick. I think we went around like twice and the op let us off. It might have even been once. The park, by the way, is notable for being for sale in the Hammacher Schlemmer. It has a super sweet Old West museum, you can throw tomahawks there, and pan for gold. It's like $10. Loved it. 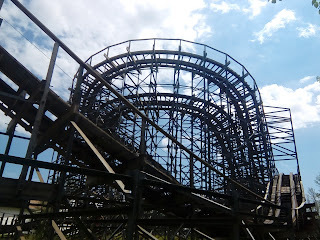 Super Cyclone Coaster, Santa's Village AZoosment Park (Dundee, IL): This is also a super cool kiddie park from the 50s, and it has mostly new rides except the fire truck ride which is, well, the fire truck ride. They have this coaster there, and it is a new Interpark Zyklon! Oh, so you're not a coaster enthusiast, and that means nothing to you? OK. So, there are production model roller coasters that are cloned a million times over, right? If you've been on Gadget's Go Coaster, congrats, you've been on a 207m Vekoma Roller Skater, please visit and enjoy any of the other 20+ identical installations in the world. Pinfari, an italian manufacturer, basically created this entire genre of ride in the 50s or 60s as a portable steel coaster that packed up nice and offered a good mix of drops and turns in a small figure 8 configuration. It is preposterously common. To make a long story short, Pinfari went out of business and their catalog was taken over by Interpark, who sells the Z40 model "Cyclon" now, and this is the worst one I've ever been on. For some ungodly reason, there's a shoulder harness in addition to the lap bar, so you are pinned to the seat and feel every bump and weld. Wacky Worm, Santa's Village AZoosment Park (Dundee, IL) The Wacky Worm. Sometimes also called the "Big Apple" in English, this is the most common production model coaster ever built. There's probably 15-20 companies making Wacky Worms. 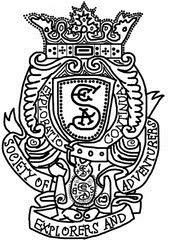 This particular one is of El Salvadorian descent and originally was installed at Old Town in Kissimmee. It isn't hideous, but it isn't anything to get excited about either. It was, most certainly, "just a credit." Brand new GCI! It isn't a bad ride, but it lacks the consistent airtime of something like White Lightning at Fun Spot Orlando. It is much more like the standard GCI style of short airtime pops and lots of curves. Maybe next year when it breaks in a little more, I'll have a different take. The overall theme of the ride is clearly Stranger Things inspired, and "The Shed" is a video based show sequence that takes place on the break run where you're attacked by a monster. Anything great? Nah, but it's cute and better than nothing, certainly. Actual effort put in: I appreciate it! Slingshot, Camden Park (Huntington, WV) My second SBF spinning coaster in a month. Max's Doggy Dog Coaster, Fantasy Island (Grand Island, NY): My second Wacky Worm in a month. This one has a front car shaped like a dog, so I guess that makes it different? Crazy Mouse, Fantasy Island (Grand Island, NY): Zamperla Crazy Mouse: Basically identical to Primeval Whirl at Disney's Animal Kingdom. Except on this one, there was a brake and block failure that led to two cars behind us colliding and us almost being hit as well. Not the strongest recommendation, this ride. Zyklon, Hamburg County Fair (NY)/Strates Shows: Strates is the last rail based carnival in the country, and honestly they don't have the biggest and best new flat rides. They do have some really cool older stuff, like multi-trailer Music rides long since abandoned for lighterweight versions by most truck based shows. You've already read about the background of the Zyklon, and this is an older model with standard lap bars instead of the abominations on the new one at Santa's Village. Wacky Worm, Hamburg County Fair (NY)/Strates Shows: There's a lot of these, OK? Wisdom doesn't make a lot of adult coasters. They did make a lot of kiddie ones. What great old story features a Python Pit? None of them. This ride came from a Jeepers (think Chuck E. Cheese but mostly defunct and with some kids rides) with the name already. The park is cute: the ride got me around once and then blew through the brakes when rain started up. I only need one lap. Roller Coaster, Blue Mountain Go-Karts (Collingwood, ON) Another Herschell Kiddie Coaster like #25, except even older and in even more suspect shape. Blue Mountain Go-Karts is exactly what the name says other wise, though I suppose I must mention the very cheap mini golf next to the coaster (and the racked up rides, some of which are in varying stages of dismantling). I like Santa's Village in Ontario: really cute park with some really nice looking rides. There's a Jet Boat ride up the Oshawa River I almost wish I did that comes with admission. But time was limited. Oh, this coaster? So it is a wintry themed SBF kiddie spinning coaster. Yes, this is a repeating theme this year. Sparetime Express, Neb's Funworld (Oshawa, ON): Suspended on a metal platform above a go kart track and seemingly caged in is this ex-Jeepers Python Pit. Toronto Island Mine Coaster, Centreville Amusement Park (Toronto, ON): Miler, another American firm, built this new kiddie/junior coaster for the folks at Centreville. I got to the park the first weekend of August, which turned out to be opening weekend due to the place being flooded up until then. That's kinda horrible and it's leading to their carousel being sold off. The coaster is Fine For What It Is. Little Dipper, Cedar Valley's Wild Frontier Fun Park (Comins, MI): Brand new park in the middle of nowhere Michigan, owned by the Golf Course next door. It ran well into October. It's very nice for a totally DIY park, and the coaster is a refurbished Herschell Little Dipper that I managed to track down the information for. Miner Mike, Colasanti's Tropical Gardens (Kingsville, ON): My wife and I went out birding when I saw a sign saying this place was a kilometer away. I knew I recognized it from RCDB, but I couldn't place what they had for a coaster. It's a Wisdom Miner Mike, their smallest model of kiddie coaster. What the hell is this though? It's a Garden center with a cafeteria, arcade, and indoor amusement park/playground. All of this next door to the Tomato Capital of Canada. Now we're getting somewhere interesting! 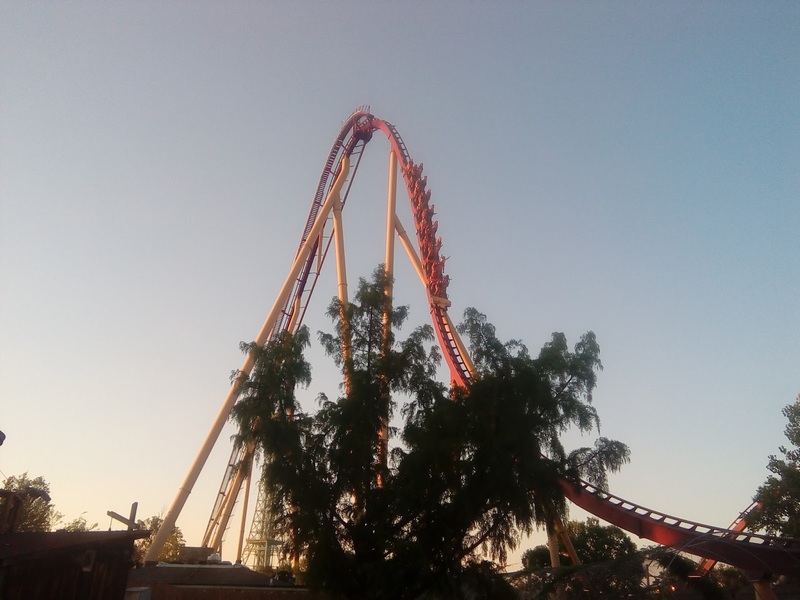 Ferrari World opened this Intamin Wing coaster in 2016, and it had a lot to live up to compared to the divisively adored/hated Skyrush at Hersheypark. Skyrush is intense - REALLY intense - with airtime some people find too painful, others find appealing. There's a few reviews of the ride out there, but none are that in-depth. So here, for your pleasure: a real in-depth review of Flying Aces. First off, let's talk queue line. You enter World War I and they've gone the full length mile to make that queue line reflect it. There's projection effects, there's a lot of big physical stuff, and it all looks really good. There's a preshow about how you, about to be a pilot, need to board, and then you go into the fully enclosed station. There's a door over the track to the outside to keep it dark, as though you're leaving a hanger. It's pretty cool. The ride itself has a fast and steep lift that leads to an aggressive and steep first drop not unlike Skyrush. However, the next element, a non-inverting loop, is way different than anything on Skyrush. It's pretty swoopy, and that's predictive of the rest of the ride. 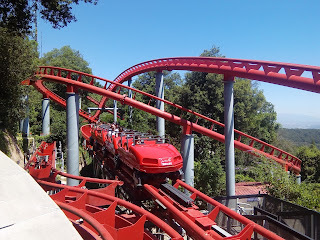 Yes, there's definitely a couple (yes, couple) airtime moments on the coaster afterwards, but more of the ride is spent in highly banked curves that don't impart a lot of positive g-force. The zero g-roll is lengthy in execution and reminds me of the one on Cedar Point's Valravn. Overall, the ride is certainly good and re-rideable, but as far as the never ending "intensity" discourse goes between B&M and Intamin rides, like no doubt about it, B&M has produced way, way more intense rides than this of late. It feels like the weird middle ground between Skyrush or Maverick and a California Screamin' style coaster that's pallet-able to the family. I really think they should have gone all out here, because it instead feels like it wasn't a full effort. Turbo Track, Ferrari World (Abu Dhabi, United Arab Emirates) A lot of people don't like this ride, which, I mean, that's their loss. It's a weird shuttle coaster that travels into the center of Ferrari World and then vertically spirals out into above the roof line. You can see cars poke out the top when you're at the race track. It certainly isn't hyper thrilling, but it is multitudes better than the S&S tower that used to be in this space. Roller Coaster, Funtazmo (Muscat, Oman) I.E. 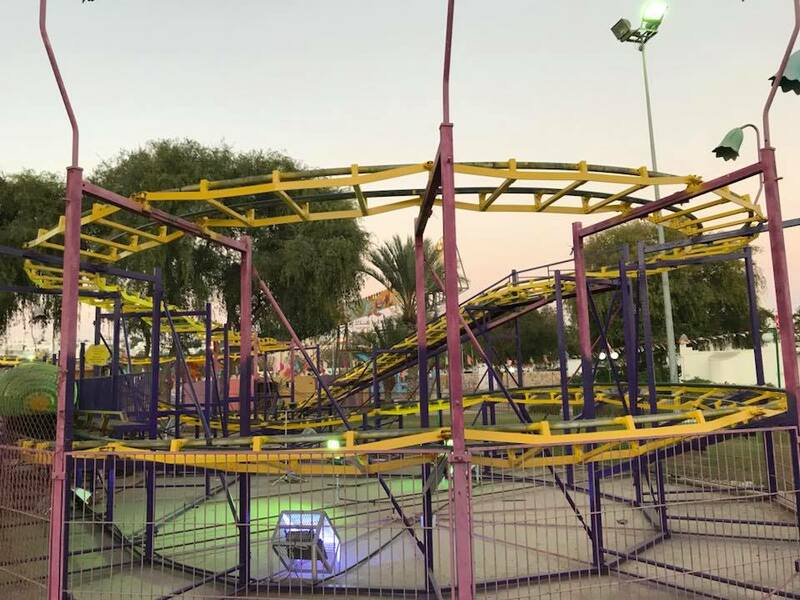 Park built this family coaster at the indoor facility that's Oman's best park of any kind. It's lengthy for being inside a mall; there's two lift hills, for example. Not too wild. Pretty decent ride. Roller Coaster Foton World Fantasia (Muscat, Oman)I.E. Park also built this ride which is a model called "Rolly". There's rock work on the ride! There's also like 40 coin operated rides like you'd expect outside a super market littering the floor here. Zane, who was with us, found that his lap bar didn't close. No one checked or cared. As we walked around Marah Land, Zane remarked, "This is the sort of place I've seen in trip reports and thought looked totally insane. And now I'm here." We did that. We went to Marah Land. There were two non-functioning coasters there: one is Death Train, a totally nutso last of its kind Schwarzkopf Kamikaze that broke down sometime in early 2016 and looks really, really bad now. The other is Typhoon, a Zyklon that had the lights on but was not running, so we were told. And then there was this: a Wacky Worm. With pieces of itself littering the underside. Here I just pushed my lapbar back up in mid ride. We were terrified. Spider-Man Doc Ock's Revenge IMG Worlds Of Adventure (Dubai, United Arab Emirates) Mack spinning coaster that is supposedly a lot like Sierra Sidewinder at Knott's Berry Farm in layout. I couldn't totally tell because there is a strict no glasses policy on this. 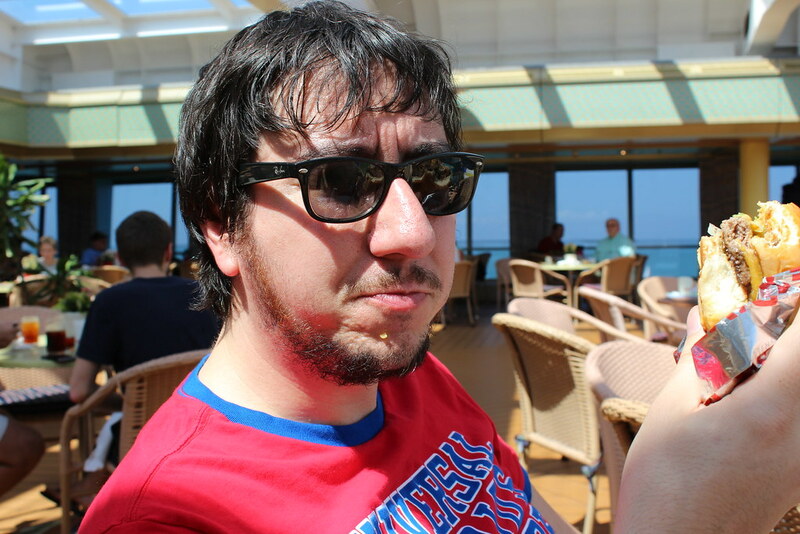 Meanwhile, glasses with a strap were allowed on the much more aggressive inverting coasters at what feels like Indoor Islands of Adventure. The ride is decent enough, I suppose. Velociraptor, IMG Worlds Of Adventure (Dubai, United Arab Emirates) And this is a slightly altered version of Blue Fire at Europa Park. Blue Fire is a launched Mack coaster with inversions and airtime and this is too. I've heard complaints that this one is "rough", which must be based on a comparison rather than any sort of objective measure of the term "rough". This is not a rough ride. This is a very good ride. It's actually a far superior ride to Flying Aces, if one wants to judge coasters like that. There's some close calls with objects thrown out there and a weird video sequence when you launch. I think there's supposed to be sound, but alas, none that day. Predator, IMG Worlds Of Adventure (Dubai, United Arab Emirates) Gerstlauer Eurofighters are, as I've already stated, good. I don't much like the over the shoulder restraints on them though, and this had them. It's a short layout that packs a punch in the midst of the Steampunk Urban Jungle Dino Island thing IMG has going on here. Vekoma builds what they call Junior Boomerangs now, which are an answer to the family coasters Gerstlauer builds I suppose. This one doesn't really have any theming EXCEPT the absurdly loud sound track that is also incredible and comical. 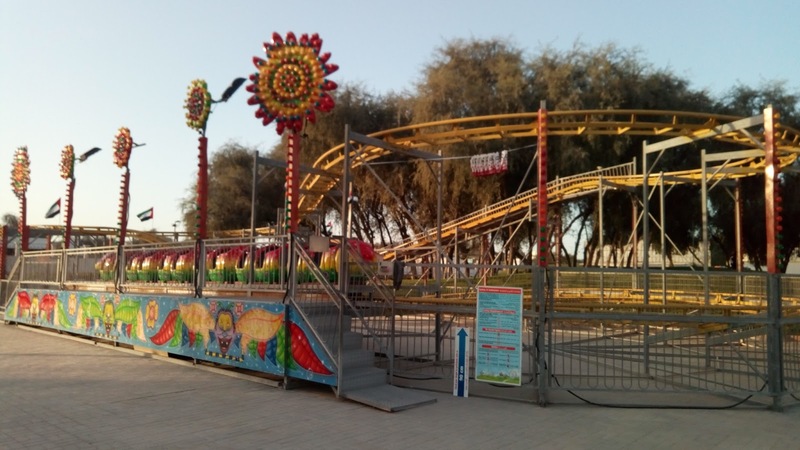 The ride itself is in the carnival section of Global Village, a huge and super well attended seasonal attraction in the UAE that draws several million people between November and April. It can best be described as "EPCOT on Acid" given the large number of international pavilions and the comparatively exotic sponsors (Saudi Arabia and Yemen, for example, have spaces). Rocket Cycles, Adventureland (Sharjah, United Arab Emirates) Adventureland is an above average Family Entertainment Center (FEC) located inside one of many shopping malls I wound up at on this day. There's two powered coasters we rode which are not listed as by their nature they don't coast. However, Rocket Cycles does coast, which is seemingly the only orthodox thing about it. It's a Zamperla Motocoaster, which means it has a motorcycle motif and that wild seating that rides such as TRON in China have. It also has a curving tire lift rather than a launch, meaning your speed is almost entirely as a result of gravity unlike every other similar ride on the planet. We liked it quite a bit and got a couple laps in. Thunder Mountain, Antic's Land (Sharjah, United Arab Emirates) RCDB indicates this ride is of South African origin at a strange, above average FEC that has, among other things, a suspended monorail and a shooting dark ride. The coaster's most notable aspects are the fake cave it occupies and that in the exit of the attraction, one finds terrariums with snakes and spiders. Roller Coaster, Fun City (Al Naeem City Center, Ras al-Khaimah, United Arab Emirates) Meredith cited this as the low point of the day as we were asked when trying to buy tickets if we had a child with us. Nah. The Filipino attendant was like "Oh" and we felt ashamed. The coaster is a small SBF Kiddie Coaster. Like really small. Coaster, Sparky's (RAK Mall, Ras al-Khaimah, United Arab Emirates) Stop 4 of the day was here at another mall to ride another coaster: this kiddie coaster was built by L&T Systems and had above average lateral forces. We weren't as embarrassed here. OK, so here's the deal: the park is just like an urban park except there's some rides there that a company called Happy Fun operates as a concession. The rides are not in hideous shape, honestly - a lot less horrifying than Marah Land - but our GPS gave us unnecessary reason to be concerned. We wound up driving through people's backyards and past camels in the desert because it interpreted a road closure as making it impossible to use the front entrance (this was not true we discovered). The side entrance we used made us pass the ride graveyard, which was full of literal junk. Just junk and broken rides everywhere, including some sort of really complex boat/submarine ride that we couldn't figure anything out on. The coaster we rode? A Wacky Worm. Of course. The thing I remember most is the antenna on the head had Red, Black, and Green ribbon (national colors) as National Day had just taken place that week. 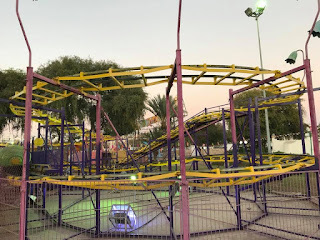 Spinning Coaster, Fun City (Bawadi Mall, Al Ain, United Arab Emirates): We drove over two hours through blown sand and rural UAE to get here - it was like 7ish or so in the evening by the time we arrived. Al Ain is a name you'd see lots of when in the region via water bottles; it's been an oasis since antiquity, and had we known better we might have gone here earlier on when we could have seen the UNESCO Heritage sites present. But we didn't really. The city of Al Ain is part of the emirate of Abu Dhabi and is pretty darn big - a lot of the athletic stadiums are actually here and not in Abu Dhabi proper. Even at night we could see the lights heading up the mountains surrounding the city that were part of Saudi Arabia. Fun City was having 1 AED rides this evening and we still had a couple left over from the minimum purchase we made at the Fun City in RAK hours prior, so that got us on the much, much larger coaster here. It's an SBF Spinning Coaster, but custom and really big. We quite liked it. Twister Mountain, Hili Fun City (Al Ain, United Arab Emirates) Last stop of the evening, arriving an hour before closing: This is a Zamperla Spinning Mouse that was the first and only coaster we'd seen all trip with separate "Family" and "Men" entrances. It was fine. Slow loading, but fine. The park has two other coasters: one is Hili Mouse, a sort of Wacky Worm on steroids that looked defunct based on the removed signage, caution tape, and train that had come apart. There's also a Zyklon we couldn't see - it's part of an extension of the park that was walled off years and years ago when it was deemed economically nonviable. Hili Fun City was apparently the first park in the region way back in the 1980s, and the dreams of a Middle Eastern Disneyland there didn't quite go as planned. Dragon, Legoland Dubai (Dubai, United Arab Emirates) Speaking of not going as planned, Dubai Parks and Resorts! First we stopped in at Legoland and knocked out their two coasters in no time. Again, they're pretty similar to other rides in the chain of the same sort. The queue for Dragon was nicer than usual, I suppose. However, the park was dead pretty much all the time. Green Hornet: High Speed Chase, Motiongate Dubai (Dubai, United Arab Emirates) A few months prior, my wife and I rode a really good Gerstlauer Bob coaster at Tripsdrill. 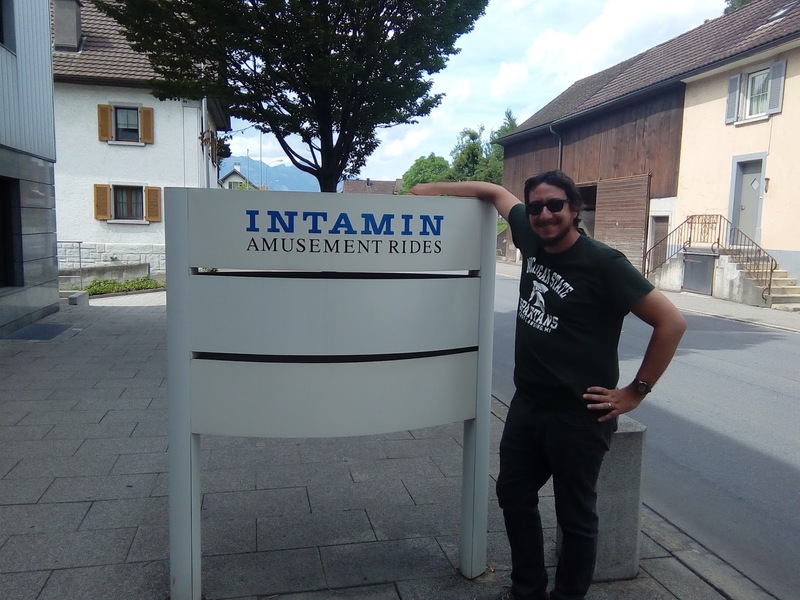 This is also a Gerstlauer Bob coaster, and it feels...unfinished? Like there's supposed to be a box around it that has a facade that fits in with the main street area and gives this a little more pizzazz. It isn't a bad ride, just unspectactular. I wound up riding it twice simply because I made the mistake of going to Motiongate before 12:30PM when rides are actually open. Smurf Village Express, Motiongate Dubai (Dubai, United Arab Emirates) It's a custom junior Gerstlauer coaster that's among the least interesting things at Motiongate Dubai. The dark ride nearby is much more interesting. There have been some slightly below average reviews of this and I guess I think you are all crazy and wrong. This is a good ride. 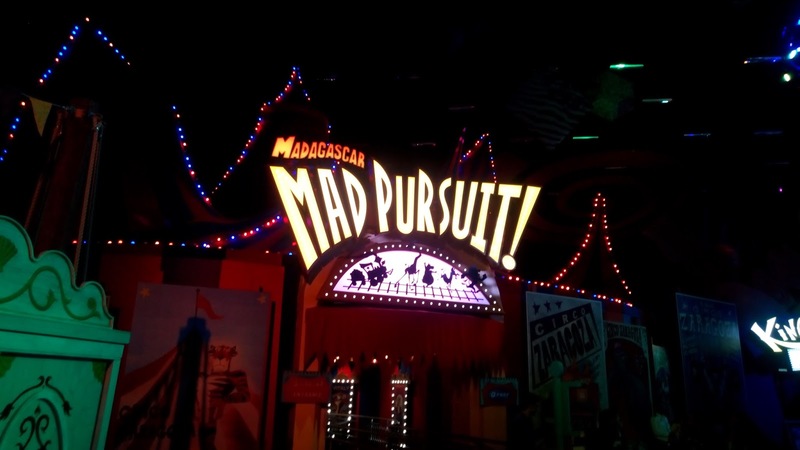 Like really good - first off, I like the theming on the ride, which is all animatronics all day and telling the story of what I guess is Madagascar 3? I never saw it, I'm not a kid or have any. And then the ride itself, a launched Gerstlauer Eurofighter, is super custom, full of airtime and speed, and just rocks. Rocks so hard. The top hat sort of element is gobs of negative Gs, and there's some wicked high speed turns and laterals here. I think it's wilder than Flying Aces. Hands down. So good. Could ride this a million times. Capitol Bullet Train, Motiongate Dubai (Dubai, United Arab Emirates) I was so excited about this because it opened about a month before I got to the park: it's a launched Mack coaster that kinda sorta acts like a shuttle coaster, a la Star Trek at Movieland Park in Germany. It definitely isn't a bad ride; but it is short. It travels very slowly through the loop, but it is super fast through the rest of the layout. I don't even know that it is that short a ride, just that it happens to be in a region where there's some really epic long steel coasters. 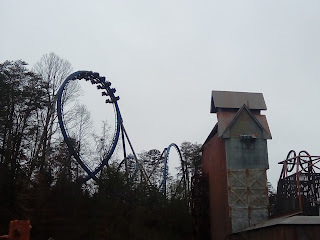 Rowdy Bear Mountain Coaster, Rowdy Bear Mountain (Gatlinburg, TN)Last coaster of the year, ridden on 12/31/17. Of the 4 Mountain Coasters I've done in the region, this is the weakest. There's not much in terms of horizontal runs and a few helices that on these sorts of rides aren't anything to write home about. I'd guess that the ones over on Wears Valley Rd. are the best overall in the area based on what I've heard about Ober's. Behemoth, Canada's Wonderland (Vaughan, ON) I ran in and hit this as part of a 6 park + boxing match + bar trip in August. Literally there no more than 45 minutes, but that was plenty sufficient for my needs since a lot of what I'd otherwise want to ride wasn't part of the early entry. Canada's Wonderland has two B&M hypers with different personalities. This is the more traditional one, featuring an airtime filled out and back run. Leviathan has become my favorite of the two, with the extra speed of the 300+ ft height and the more non-traditional layout of big drops and fast curves. Still, most parks would kill to have this as their second place attraction. It's very good. Speaking of B&M hypers with out and back layouts, Diamondback! It's a lot like Behemoth, except maybe that I prefer the natural terrain and trees here to Behemoth feeling like it's in a field next to the water park. The splashdown element is at play here too, but you don't really experience it except from the midway watching. Adventure Express, Kings Island (Mason, OH) This was the first coaster I ever rode at the park when I came here in 1997 on my first coaster trip 21 years ago. Yeah, I've been doing the enthusiast thing for more than two decades. Don't remind me. Back then, I was stunned by the ending. I never heard anything about it, so it was just a shock to be like "Oh, the ride is just over now?" Of course, not I've been here a ton and it's old hat. The ride is a blitz starting out of the station, and it's way above average mine train fare there. But then the end with the statues and "YOU WILL PAY"? Yeah, this thing is a classic now. The Beast Kings Island (Mason, OH) My wife waited an hour to get her first Beast night ride. We'd had plenty of day rides, and, look, Beast during the day is just the saddest and weirdest mine train coaster of all time. At night, it is still a mine train coaster and still weird, but it at least offers noise and the unexpected due to its immense length. Riding The Beast at night is an important step in the path to adulthood for Cincinnati area residents. Now she sees why. GCI wood coaster operated by an amusement park/water park/race facility hybrid. Dispatches on this were so slow - like 7-8 minute cycles between trains going out - that I actually left the park after driving 2 hours to get there having been on only twice. Why make this difficult? 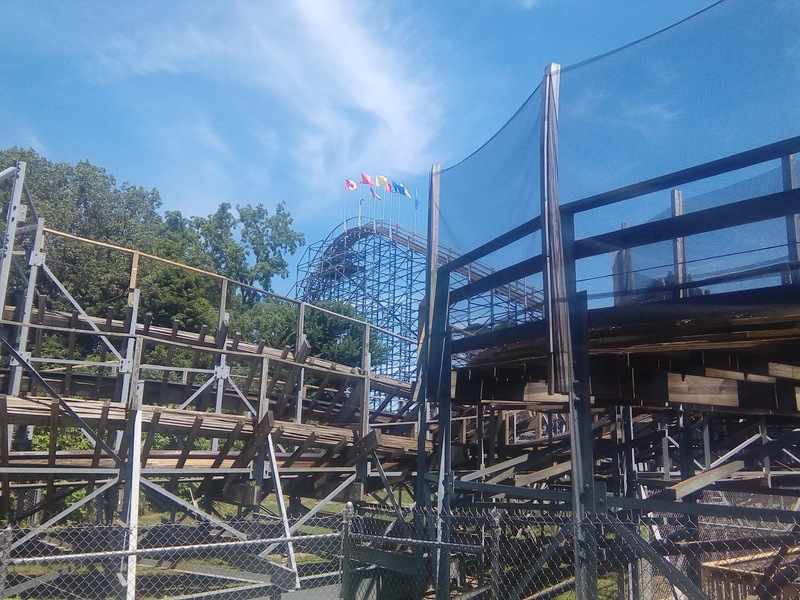 Mike Saunders, a friend of mine, calls riding Kentucky Rumbler after going on the wood coasters of Holiday World "eating hamburger after filet mignon." I can't stop eating and maybe I can't actually detect quality any more, so I guess I like both when I'm in the area. Plus I don't care about going to Holiday World during the day for anything at Holiwood Nights. Sorry guys! Big Dipper, Camden Park (Huntington, WV) Camden Park has actually seen a lot of improvements over the years, which is difficult to believe when one sees the Big Dipper signage missing letters, the train missing a back seat, and a trim brake held closed by a rope tied to concrete blocks. The old NAD trains are getting up there in years and look it, but hopefully they keep putting in the money since the better benches on this are still comfy. Plus the feeling of a wood coaster with no seat dividers and a single lapbar is and will always be the best. The ride is passable; a couple airtime spots (one huge) on a short layout. Magnum, Cedar Point (Sandusky, OH) As a general rule, I refuse to claim that Michigan's Adventure is my "home park" regardless of it being an hour closer to my home than Cedar Point. The longer operating season along with the abjectly higher quality of Cedar Point makes me simply say that it is, even if day trips there are unnecessarily harsh and undesirable. I went on more than just the rides listed here, but look at that - 9 coasters any park would be happy with. I actually do fine with the Magnum trains and their minimal padding, even in the "ejector seat" of the third row in car one; so fine it's probably my favorite hyper coaster and a top level steel for me. 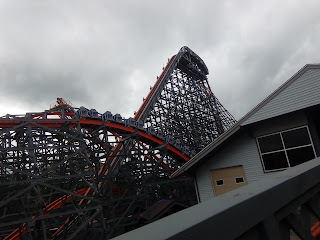 Maverick and Millennium Force would be top 25 steel too if I ranked those at this stage (I long ago stopped), and all 4 B&Ms are great examples of their constituent styles, though none of them are the best. 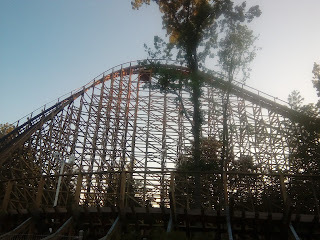 Blue Streak is, aside from being the coaster my wife and I met while working, a really solid out and back wood coaster. I could ride that thing all day front or back. And Dragster is a pain to ride because of its inconsistency, but that launch still has a huge kick. Beyond these, Cedar Point still has several other coasters worth riding - Wicked Twister, Gemini, Cedar Creek Mine Ride, and of course Steel Vengeance coming in 2018. Now they just need something to do when it rains. Lightning Rod, Dollywood (Pigeon Forge, TN) One of the last coasters we got in in 2017 and the longest wait of the year at 90 minutes; it was worth it. It honestly isn't that long of a ride, but what's there is so substantive and so thrilling that it more than makes up for it. The launched lift and huge steep drops are outstanding. I wouldn't call it the best in the world, but it is really, really good. Wild Eagle is just kinda there for us. Opening year there was a lot of interest because it was a newer type of ride from B&M, but at this point I think most people look at it as though it is the weakest of the style. Really, there's not much about the layout that couldn't have been accomplished without using different trains, and the lack of close proximity to anything while every other ride has theming elements or design things to take advantage of the trains is unfortunate to say the least. It isn't a bad ride, just underwhelming for someone who's been on more than a couple coasters. Thunderhead, Dollywood (Pigeon Forge, TN) Last ride of the day on 12/30, and after Lightning Rod, which kinda took the shine off this. 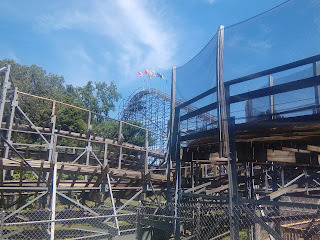 It was running really well, which made me happy - the prior year this GCI wood coaster had some real bounce and shake to it. I still think of it as my favorite ride they built. It's a long layout, shockingly intense for them, good mix of turns with laterals, some sustained air, and some quick pops. Mystery Mine, Dollywood (Pigeon Forge, TN) A New Year's ride from waaaaay back at the start of 2017. Mystery Mine's OTSRs are uncomfortable and the weakest link in what is otherwise probably among the best themed looping coasters in the world. It has a really cool layout, I just wish it had lapbars. Tennessee Tornado, Dollywood (Pigeon Forge, TN) The best Arrow looper ever built and we all know it. Big, fresh feeling elements, great use of the terrain, and smooth transitions. It's a real powerhouse. This CCI Wood Coaster opened in '99, and the intent was to create something that was like the old Crystal Beach Comet (now at Great Escape). You squint and you can kind of see it. Kinda. Steel supports, wood track, the layout is like a very compact out and back. But there's not much airtime, unlike the old Comet, and the most notable thing that happens is a really gnarly lateral jolt on the ride's final run to the breaks. Formula Rossa, Ferrari World (Abu Dhabi, United Arab Emirates) The World's Fastest Roller Coaster: Unlike several of the rides that preceded it, this is a full fledged real big boy attraction that does more than go fast, go up, go down, and hit breaks. With 6,500 feet of track, it's among the ten longest roller coasters in the world and easily the longest launched coaster. It keeps up a phenomenal pace throughout the length of the ride, akin to Millennium Force's overall sense of speed but yet greater. For me, it's one of the great achievements in the theme park world and an absolute master class of layout. Fiorano GT, Ferrari World (Abu Dhabi, United Arab Emirates) This isn't as much of a master class in anything - it's like a strange unthemed coaster based version of Test Track. With a racing element. Not bad necessarily, just weird. Lots and lots of launches outdoors and in the desert. Voyage, Holiday World (Santa Claus, IN) I only go to Holiday World for the coaster enthusiast event Holiwood Nights. Why? Well, it's the one time of the year where Voyage runs with the block brake off. Every night after the park closes to the general public and exclusive ride time is to begin, maintenance heads over and sets the ride to blow right through what is otherwise a dead stop before the triple down that starts the ending series of the ride. The additional speed and the lack of dead time takes the ride to its correct level, the way it was meant to be enjoyed. Legend and Raven were running well and OK respectively too; that was good since Voyage wound up closed for much of the Saturday ERT session. Yes, I've said it already here, but I'm a wood coaster guy, and these are basically the wood coasters in my book. For some people, they'll be too intense, especially Voyage. Voyage is long (6,400+ feet long), absurdly fast, and features a ton of extreme changes of direction that are simply too much for a lot of people. You can tell where people's thresholds are when the Voyage fans say it's running great and the people for whom it represents the line think it is "rough" (it honestly rarely ever is). It's in many ways the continuation of what Raven and Legend intended to do stylistically, taking that kind of nonstop action wood coaster to a final logical conclusion. It's my favorite ride of any kind, anywhere. Thunderbird, Holiday World (Santa Claus, IN) Holiday World finally invested in a steel coaster a few years back and got a really killer B&M Wing Coaster. The launch really throws you back, and it has solid intensity and some great close calls with scenery. It looks like they have the electricity situation figured out and the diesel generators are gone. Boulder Dash, Lake Compounce (Bristol, CT) My rides in May on this were solid - some of the best I've had in years. However, one train operation is now pretty much the default for this coaster, and that means that visits to the park are nowhere near as enjoyable as they were in the early 2000s when a higher premium was put on capacity. I'd have gone back the same day and cranked out a ton of night rides, but I'm not waiting an hour to get a single ride in at this point. Still, this is a really excellent ride with outstanding use of terrain, one of the most unique layouts anywhere, and a superb series of airtime hills heading back to the station. 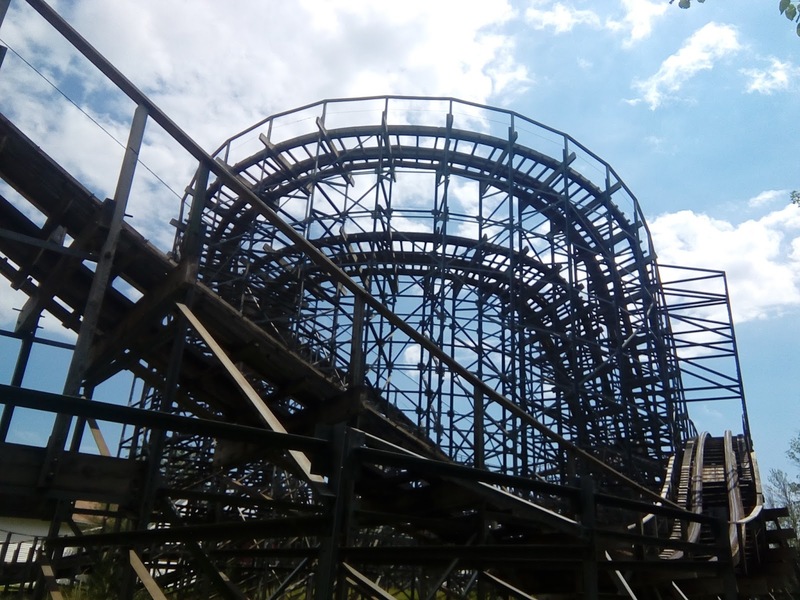 Shivering Timbers, Michigan's Adventure (Muskegon, MI) Entering year 1000 of a never ending rehab job, you can see fresh wood as you ascend the lift hill on this once top tier coaster. There's still a lot to like here: the ride is big, long, and generally pretty fast. The loss of the trick-track (a run of undulating track that was inspired by Harry Traver's creations in the 30s) and replacement with an airtime hill is probably a net improvement over any recalled version of the coaster. It still could be a bit smoother, and some of the hills definitely feel as though they have a ramp-ier profile than more recent woodies. The trim break prior to the helix is on hard, preventing the train from doing much of anything there. It's too bad the angle of approach from the "back" run of the coaster effectively requires this exists, otherwise I'd say to just get rid of it. It's still fun, it's just that I and my wife both have memories from the early days of it's life that far outweigh what's here now. Wolverine Wildcat, Michigan's Adventure (Muskegon, MI) Charles Dinn and Larry Summers built a lot of wood coasters in the 80s and early 90s, and they prided themselves on making big attractions that weren't too scary to ride. Basically the opposite of what any coaster designer should be doing, really. Wolverine Wildcat is based on the Knoebel's Phoenix, except it is a pretty lousy ride bereft of exciting forces or sustained speed, whereas the Phoenix is great. Raging Bull, Six Flags Great America (Gurnee, IL) One of the few rides we hit at Great America this year given our limited time in the park, I still think it's among my favorite B&M hypers simply because it has such a different layout. There's a lot of coaster enthusiasts that complain about the use of trim brakes on the ride, even though I still feel airtime over practically every hill. I really don't get it? Superman, Six Flags New England (Agawam, MA) #1 in the world via all the polls in the early 2000s, this was always my pick for best Intamin hyper coaster. I think the new fashioned restraints on it are trash, but that's just a personal opinion that also happens to be entirely correct. It lacks the mediocre S-curves that are prevalent on Goliath at Walibi Holland and Expedition Ge-Force at Germany's Holiday Park, and it also never has anything like the long, straight, flat portions of the Superman rides in Darien Lake or Six Flags America. It's all killer, no filler. If only it had a better train, though. One that could adequately fit people over 5'8''? Thunderbolt, Six Flags New England (Agawam, MA) I hadn't been on this so long, I think the last ride I had was with single position lap bars. We rode towards the back and I guess it might be a front seat ride? Considering how many times I went on this between 1992 and 2004, I really should have a clearer memory of it, but time has dimmed that. It's fine. The best thing about it now might be the old 1940s/50s era signage. Tornado, Strickers Grove (Ross, OH) Stricker's is not a typical park: it is a private picnic park that is open but for only a few select days a year. I've been once before (2009) and it wound up being packed to the gills. This visit? Not so much. Tornado is based on the Comet from Rocky Glen; one of the great old Pennsylvania trolley parks. I tend to think that maybe they could have picked a more thrilling ride: yeah, great for families, blah blah blah. It also doesn't do much. There's one part to the ride that has some airtime. That's about it. But I really enjoy the fact that it exists, and Stricker's is a blast to go to because it is such a total throwback. Comet, Waldameer Park (Erie, PA) I hadn't been to Waldameer in a long time, and due to crowds that last time, it had been 14 years since I'd been on the Comet. Comet's a pretty exciting coaster, honestly! The layout isn't giant, but there's airtime there to be had, and it books along nicely. Because we showed up on a Sunday with minimal crowds, I got some serious riding on RFII. It's one of Gravity Group's mid-2000s new classics along with Boardwalk Bullet and Voyage, and while the layout isn't flawless from a perspective of being "nonstop", it definitely brings a lot of thrills to the table and a great use of the terrain. Excellent airtime, big super banked curves, and just tons and tons of fun at one of the best traditional parks in the nation. No better way to end the this list.